The force is strong with this Star Wars Lightsaber Bottle Opener! This Star Wars Lightsaber Bottle Opener is the perfect way to open your beer, soda, or the occasional bottle of blue milk. Well, the ones that come with a bottle cap, anyway. As a more elegant opener for a more civilized beer, this Star Wars Lightsaber Bottle Opener is the tool of choice for every Star Wars fan when it’s time for a drink. With each use, the Star Wars Lightsaber Bottle Opener makes the swooshing lightsaber sound so you don’t have to (although, you probably still will). 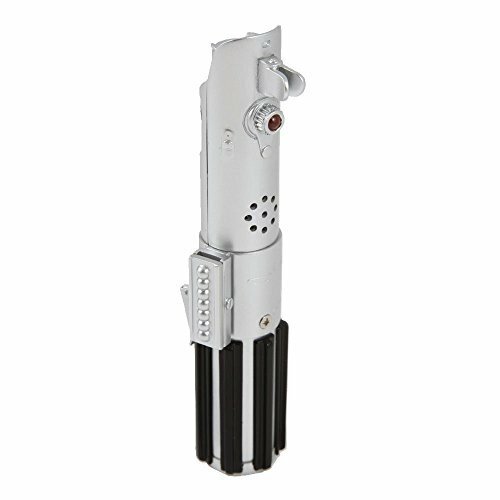 Made of durable plastic, this miniature replica lightsaber won’t burn though durasteel doors, but that won’t stop you from pretending it will. When it’s time to open a bottle, skip using the force and reach straight for this opener to drink like a Jedi. Oh yeah, despite being (basically) space monks, it turns out there’s nothing in the Jedi code discouraging the occasional binger. Of course, I imagine, the hangover headache would make using the force a touchy proposition but, it’s not against the rules. Along with the Darth Vader Lightsaber Tongs, it’s perfect for a Star Wars themed backyard BBQ. Weight 0.6 ounces (17 g). Looks like Anakin’s/Luke’s original saber. Makes light saber sounds sampled from the movies when used. Batteries included (though some people have said they might be dead when you get them). Why yes, I do prefer dark beer, why do you ask? Is it because I already force-choked three people who annoyed me today?